Obituary – Mason, Mildred (Tate) « Perry High School Alumni Association, Inc.
Excelsion ’20, Glee Club, Normal Training, Club Espanol. Mildred Mason, 83, 709 Maple street, died at 3 p.m. Friday at Perry Memorial hospital. Funeral will be at 1 p.m. Monday at Parker Funeral chapel. Rev. Barbara Sherer will officiate and burial will be at the Union cemetery at Billings. Mrs. Mason, daughter of John and Martha Tate, was born in Perry, July 15, 1900. She was a 1920 graduate of Perry high school and attended Shawnee Business college. She and Leedy Mason were married in Okla­homa City in 1945. Mason pre­ceded his wife in death in 1976. 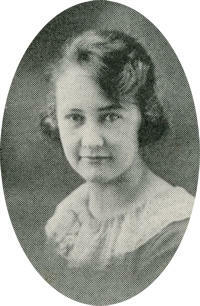 Mrs. Mason taught school at Owasso and was a secretary for the Public Service company at Tulsa from 1938-45. She was a member of the Presbyterian church. Mrs. Mason is survived by one brother Kenneth Tate, Tulsa.